What to do and see in Cáceres? The province of Cáceres is one of the most beautiful in Spain. Amazingly intact historical cities, sleepy rural towns and beautiful natural reserves. Sharply cold in the Winter, and very hot at the height of Summer, Cáceres is perhaps most stunning in the Spring, when the cherry groves in Jerte Valley are in blossom, the mountain snow is thawing, and the flora and fauna seem to come alive. It is also stunning in the autumn, when vast wooded areas seem ablaze with autumn colours, and the old buildings in Cáceres and Trujillo become red and orange under the autumn sun. Cáceres is the capital city of the Region of Extremadura, one of Spain's poorest regions in terms of per capita, but richest in terms of historical heritage, gastronomy, wines and unspoilt nature. Cáceres was declared a World Heritage City by UNESCO in 1986 because of the city's blend of Roman, Islamic, Northern Gothic and Italian Renaissance styles, fruit of the many battles fought here throughout history. 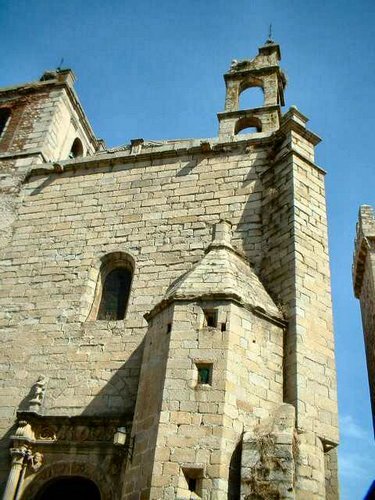 An amazing 30 towers from the Muslim period still stand in Cáceres, of which the Torre del Bujaco is the most famous. This virtual guide of Cáceres gives you some idea of the beauty of the city. The origins of Cáceres go back to prehistoric time, as evidenced by the paintings in the Cuevas de Maltravieso (Maltravieso Caves) which date back from the late Paleolithic period. The best way to savour this unique city is to leave your car in one of the carparks located outside the historical centre, and then to stroll around the historical quarters at your leisure to admire the numerous buildings, towers, palaces and plazas most very well conserved or recently restored, dating from the Middle Ages and Rennaisance. Visitors will be able to see remnants from Medieval times, Roman occupation, Moor occupation and Jewish influence. Cáceres has four main areas to be explored; the historical quarter, the Jewish quarter, the modern center, and the outskirts. As mentioned above, the first evidence of humans living in Cáceres is from the Late Paleolithic era, around 25,000 B.C. Cáceres started to gain importance as a strategic city under Roman occupation, and remains found in the city suggest that it was a thriving center as early as 25 B.C. Some remains of the first wall built around the city by the Romans in III and IV A.D. still exist, including one entrance, Arco del Cristo. After the end of the Roman Empire, the city was occupied Barbarians and Visigoths and entered a period of decline and decay until the Arabs conquered Cáceres in the seven hundreds. The city spent the next few centuries mostly under Arab rule, although power did exchange from Moors to Christians several times. During this time, the Arabs rebuilt the city, including a wall and various towers, including the Torre de Bujaco, and palaces. Cáceres was reconquered by the Christians in the 13th century. During this period the city had an important Jewish quarter: in the 15th Century when the total population was 2,000, nearly 140 Jewish families lived in Caceres. The Jewish population was expelled in 1492, but many remnants which are a result of the Jewish influence during this period are still be seen today in the Barrio San Antonio. Cáceres flourished during the Reconquest and the Discovery of America, as influential Spanish families and nobles built homes and small palaces here, and many members of families from Extremadura participated in voyages to America where they made their fortune. In the 19th Century Cáceres became the capital of the province, marking a period of growth which was halted by the Spanish Civil War. The headquarters of the University and several regional government departments are to be found in Cáceres which today has a population of 85,000 inhabitants. Palaces and stately homes: Palacio de los Golfines de Arriba; Palacio de los Golfines de Abajo - one of the most spectacular. The Reyes Católicos, Isabella and Ferdinand, lived here; Palacio del Comendador de Alcuescar; Palacio-Fortaleza de los Torreorgaz, today a Parador hotel, Palacio Episcopal; Palacio de Carvajal XVc; Palacio de Godoy; Palacio de Mayoralgo; Mansión de los Sande; Palacio de las Veletas; Palacio de los Cáceres-Ovando; Casa del Mono; Palacio de los Toledo-Moctezuma; Casa del Sol; Casa Mudejar; Casa de Carvajal y Ulloa. Museum of Cáceres - housed in La Casa de las Veletas y la Casa de los Caballos in the historical quarter. Museo Concatedral de Cáceres, in the Plaza Santa Maria. Religious art. Fiesta de los mártires in January; Fiesta de las Candelas and Fiesta de San Blas in February. The most important local fiestas in Cáceres are in April, San Jorge, when on 22nd-23rd a dragon is burnt on a bonfire in the Plaza Mayor, accompanied by a fireworks display. Ferias de Mayo in May. Semana Santa processions are quite a spectacle as they wind around the narrow streets in the historical center. The small streets in the historical center have lots of small shops selling typical products. The convents sell delicious homemade sweets and pastries. Wines from Extremadura are cheaper than many other wine-making areas and quite delicious if you like full-bodied red wine. Also try and buy some cherry liquor made with cherries from the nearby Jerte valley, or other original liquors such as chestnut or blackberry. Other local produce you can buy in most towns and villages in the province of Cáceres include goats cheese (Torta del Casar), fig cake, chestnuts, hams and other pork products, lamb, olive oil, paprika (pimentón de la Vera). Meliá Cáceres **** one of the nicest of the Melia chain of hotels, set in a XVIc palace in the city center; Cáceres Golf **** on the outskirts with a 18-hole golf course for visitors wanting to combine sport and culture. Hospedería Puente de Alconétar **** a beautiful XVc Palace in Garrovillas de Alconétar; Convento de la Luz **** a peaceful hotel set in a XVIc convent in Brozas; Hospedería del Real Monasterio** a modest hotel with the rooms set around a magnificent XVIc cloister in Guadalupe; Hospedería Valle del Jerte****, 25km from Plasencia in a converted olive oil mill with lovely views of the beautiful Jerte Valley; Isla del Gallo**** in Trujillo. Plasencia: Declared a World Heritage City by the UNESCO in 1993. See photos of Plasencia. Guadalupe: Monastery of Guadalupe where the Virgin of Guadalupe is. Trujillo: Beautiful medieval, monumental town. Birthplace of many of Spain's most famous conquerors, including Francisco Pizarro (founder of Peru), Francisco Orellano (Amazon) and Diego García de Paredes (Venezuela). Alcántara: Roman bridge, 200m and 60m high with 6 arches. Built in 106 AD. The Monasterio de Yuste chosen by Carlos V as to die is also worth visiting. Only open in the morning on Sundays. Monfrague Natural Park: 17,852 hectares, the Parque Natural de Monfragüecontains the following villages: Torrejón el Rubio, Serradilla, Malpartida de Plasencia, Toril, Serrejón, Jaraicejo y Casas de Miravete. With one of the largest forests in Spain with over 1,400 different species of trees. A favourite with birdwatchers, the park has the world's largest colony of black vultures and imperial eagles, and is also home to colonies of black storks, eagle owls, black-shouldered kites, grassland birds including great bustards, sandgrouse.... Camping is not allowed in the park. Monumento natural Los Barruecos - curious rock formation. If you wish to contact us or add any information to this guide to Cáceres, please write to us here.